Ami Polymers applies Teflon and other Fluoropolymer coatings by liquid or powder spray methods using latest coating technologies. PTFE and its various copolymers such as PVDF, TEFZEL, HALAR, FEP and PFA are applied as powder or liquid. PVDF is good up to 120°C. Tefzel/Halar is good up to 150°C. FEP is good up to 195°C. PTFE/PFA is good up to 260° C.
FEP (Fluorinated Ethylene Propylene) gives the best non-stick properties among all Fluropolymers. PVDF can be build up between 150 and 200 microns. Tefzel/Halar can be build up between 200 to 300 microns. FEP can be build up between 75 to 125 microns. PFA hard coat can be build up between 400 to 500 microns. PTFE can be build up between 50 to 70 microns. The parts to be coated have to be brought at the site of Ami Polymers as the coating process involves thorough surface preparation, accurate spraying (clean air) and controlled oven/furnace monitoring. Later on, if need arises coated parts can be repaired at customers site. The repair job at customers end will depend on the extent of damage and kind of damage to the coating. 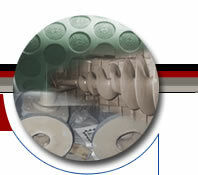 We follow following coating process steps. 4. Air dry the primer or bake the primer in the oven. 5. Spray the top coat (Fluoropolymer) and cure it in the oven/furnace. Repeat the 5th step till the desired thickness is attained. Full vacuum can be applied in coated vessels. The Porosity in the coating can be checked either by a spark tester or Ultrasound tester or Phenolphthalein test as the case may be. Guarantee : We offer a guarantee of workmanship & will issue a Certificate stating the nature of Polymer used. Our recommendation of TEFLON/TEFZEL/KYNAR as a material of coating based on available technical literature of the resin supplier and our past experience. However, No Guarantee can be given regarding performance of the coating in actual condition due to many factors unknown to us and beyond our control. Delivery : After confirming the material in stock and approving surface preparation, 7 to 20 days depending on the type and thickness of coating to be applied.